Join Us for Snana-Yatra Festival this Sunday! ~ The Toronto Hare Krishna Temple! Join Us for Snana-Yatra Festival this Sunday! A sure sign that the annual Festival of India (Ratha-Yatra) is just around the corner is the annual Snana-Yatra festival (Sunday, June 30, 2013)! Snana-Yatra, a wonderful festival, wherein Lord Jagannatha, Lord Balarama and Lady Subhadra will be bathed amidst amazing kirtan and chanting! After this bathing ceremony, all three fall ill and go into seclusion in order to get better. After two weeks, They will re-emerge for Festival of India (Ratha Yatra). It is important that the temple is clean for when Lord Jaganatha makes His appearance after recuperating from being ill for two weeks. Thus, as tradition every year, we will be cleaning the temple as part of Gundica Clean Up. This is following the example set by Sri Caitanya Mahaprabhu, who held the first Gundica Clean Up some 500 years ago. Please join us at 11:00am on Sunday, June 30th to help clean a part of the temple! During the Ratha-Yatra Festival on July 13-14, Lord Jagannātha will once again come before the public. 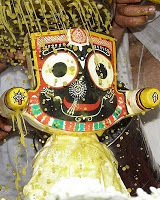 Thus, for thirteen days after the bathing ceremony, Lord Jagannātha is not visible to any visitors! Don't miss out this last opportunity to see Lord Jagannatha before His grand festival!